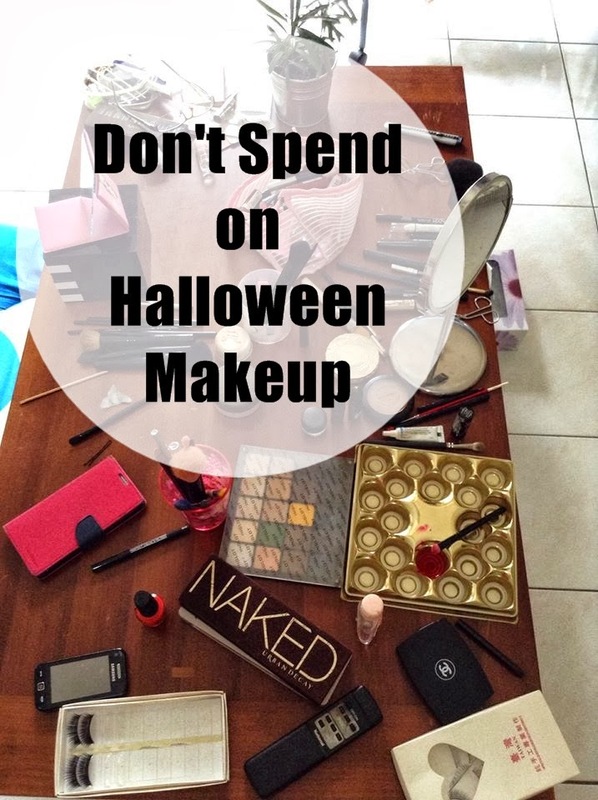 Halloween is the best time of the year for makeup junkies to go all out, doing any kind of makeup which you can't normally wear. While other beauty bloggers trying to recommend to you what product to buy, I am trying to encourage you NOT TO BUY new products (makeup brands going to hate me for this). I've checked, a bottle of face paint can cost up to RM60 per color. Is it worth it to spend the money for just a few hours event? Use foundation which is three shades lighter than your skin tone to get that pale-ghost effect. Borrow it from your fair skin friend. Alternatively, use any foundation/BB cream/CC cream/face primer, then dust a matte white eyeshadow on top. It will give you a pale skin. Gel liner solves everything. Unless you're painting the entire face black, then go for a black face paint. Even that, you can put on your normal foundation, and set it with black eyeshadow. That will create a "black face". Ultimately, you can use gel liner to draw the outline. Use eyelash glue to create texture scar. Layer it until you get that desired scar. UHU glue works too! Tips #4 - You don't need fake blood. A bottle of fake blood cost about RM50. Why pay when you can create it out of lipstick and baby oil. Cut a little bit of your red lipstick for the pigment, dilute it with baby oil. Keep adding the lipstick or baby oil until you get the texture that you want. To create splatter effect, use old tooth brush by rubbing the bristles. What are you going to dress up for Halloween? Consistently, we see the average apparitions and witches for Halloween and it can get a bit of exhausting for consistent partiers and treat seekers. In spite of the fact that not everybody preferences to be the same thing for Halloween makeup consistently, individuals begrudge others' ensembles in light of the fact that it was excessively cerebrum racking to consider new thoughts for ourselves. Extending from Tim Burton's Alice in Wonderland-motivated exercises to Joker's vile scars, Harry Potter and The Avengers-roused eye shadow and even signature anime eyes, here are some extraordinary Halloween cosmetics how-tos and rousing exhibitions to help you turn into the begrudged one at this present year's Halloween party. Consistently, we see the average apparitions and witches for Halloween and it can get a bit of exhausting for consistent partiers and treat seekers. In spite of the fact that not everybody preferences to be the same thing for Halloween makeup consistently, individuals begrudge others' ensembles in light of the fact that it was excessively cerebrum racking to consider new thoughts for ourselves. The beauty & Makeup tips Extending from Tim Burton's Alice in Wonderland-motivated exercises to Joker's vile scars, Harry Potter and The Avengers-roused eye shadow and even signature anime eyes, here are some extraordinary Halloween cosmetics how-tos and rousing exhibitions to help you turn into the begrudged one at this present year's Halloween party. To get more Fashion and styles visit styles pk.